Promises to tax the rich and to make infrastructure investment a priority—along with an embrace of diversity—beat the right in Canada. It may be true that American Democrats have nothing better to do than wait for Joe Biden to decide whether he will mount a third bid for the presidency. Or, failing that, to try to figure out what it is about democratic socialism that might appeal to underemployed young people who are burdened with staggering student debt and face the prospect of getting kicked off a parent’s health insurance plan. But if America’s Democrats could look away from the 2016 horse race for just a moment, they might actually learn something about going big—and winning big—from Justin Trudeau. The 43-year-old leader of Canada’s Liberal Party was not supposed to come out of the country’s 2015 election as its prime minister. At the start of the race, Conservative Prime Minister Stephen Harper, ally of George W. Bush, role model for Scott Walker, was locked in serious competition with a cautiously left-leaning New Democratic Party. The traditionally centrist Liberals (at their best “vital center,” at their worst blandly managerial), having been very nearly obliterated in the previous election, did not look particularly viable. And party leader Trudeau was frequently dismissed as the good-looking but inexperienced son of a great 20th-century prime minister. Trudeau placed a lot of emphasis on hope and change, which drew comparisons to Barack Obama’s inspired campaigns of 2008 and 2012. Obama and the Democrats faced significant challenges in both those US elections, but Obama’s skills and vision — and the ability of his campaign to forge unprecedented coalitions — transformed those electoral moments. In 2016, however, Democrats will not have Obama on the ballot; and as the 2010 and 2014 elections cycles confirmed, Democrats struggle politically in such circumstances. That’s why Trudeau’s example is instructive. As a party leader seeking to renew a battered brand and to displace a wily incumbent, the Canadian faced skepticism about his own leadership skills and about the ability of the Liberals to get their act together. As such, he had to give new meaning to the Liberal promise of “real change”—just as American Democrats in 2016 races for the White House and Congress will have to frame a message that, while building on Obama’s accomplishments (and perhaps showing a bit more respect for the president’s political wisdom than many Democrats did in 2014), gives a sense of where the party will go next. 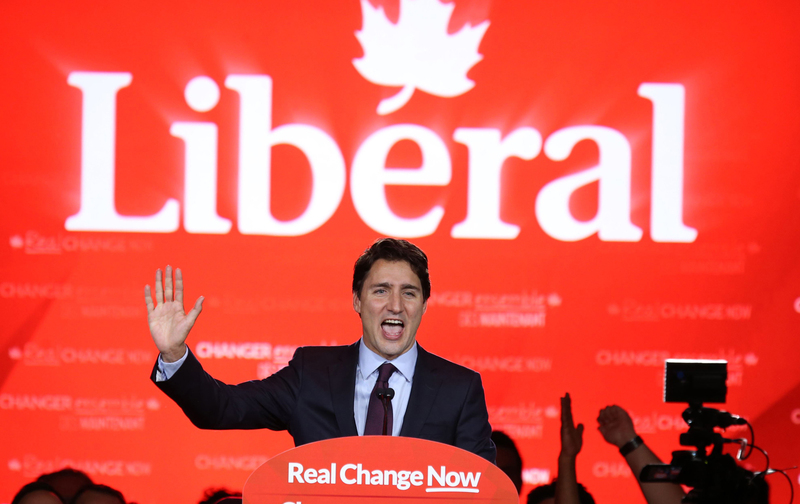 Trudeau surprised almost everyone by running a campaign that veered left on economics—so much so that analysts noted that, on several critical measures, the Liberals outflanked the historically social-democratic NDP. Trudeau did not run as a radical, which makes sense, as he is not one. But he did make a reasonably radical break with the tepid politics of too many political leaders in this age of austerity. Instead of fretting endlessly about spending and budget deficits, he declared that his priorities would be job creation and policies to benefit the middle class. And he said he would invest in the future, rather than cheating it with austerity cuts. More vital even than the promise of fair and progressive taxation after so many years of Harper’s of-the-rich, for-the rich, by-the-rich governance, however, was Trudeau’s proposal to invest massively in job-creating infrastructure programs. To fund the investment, Trudeau proposed that Canada could and should accept a reasonable level of deficit spending. He even cut a television ad—which became a YouTube sensation—that explained Keynesian economics on an escalator. There is no need to make Trudeau a hero, or an across-the-board role model. But there is every reason to recognize the genius of the escalator ad, and the role played by Trudeau’s broad and bold economic message in producing a dramatic political shift. At the end of a campaign where they started in third place, Liberals have achieved an absolute majority in parliament. Democrats should take a serious look at Trudeau’s ad, and at Trudeau’s message. It’s a powerful one, with the potential to push politics beyond the limp austerity versus austerity-lite debate that has turned so many Americans (especially young Americans) against the idea that voting matters. This is, at least to some extent, what Vermont Senator Bernie Sanders is talking about when he proposes a “political revolution,” and it is what Massachusetts Senator Elizabeth Warren and Congressional Progressive Caucus leaders such as Keith Ellison of Minnesota and Raul Grijalva of Arizona have been hinting at with big proposals to address student debt, alter trade policies, and invest in infrastructure in the United States. But the boldness and the optimism—and the creativity—with which Trudeau delivered the message is instructive. The point here is not to suggest that Hillary Clinton should get on an escalator, nor that American Democrats should borrow the entire Trudeau playbook. But a few pages are worth studying. It is certainly true that Canada’s political process is distinguished by traditions, structural characteristics, and nuances of party history and personality that make the country’s elections very different from those in the United States. Despite the increasingly “presidential” character of Canadian campaigns, voters choose parties rather than presidential candidates (and party leaders sometimes lose in their own constituencies and end up not just out of the running but out of Parliament). Canadians have more political options than Americans: Liberals, Conservatives, and the NDP run provincial governments; the Greens and the Bloc Québécois sit in parliament. Canada has shorter campaigns that are dramatically less expensive. Canada has a different media system, with stronger commitments to public broadcasting, serious debate, analysis, and dialogue. And, of course, while Canadian Liberals were campaigning to turn out a Conservative prime minister, American Democrats will be campaigning to carry on from a Democratic president while at the same time ending Republican control of Congress.